For those of us in the video industry, finding resources can be addicting. I love tools. I love ebooks. I shouldn’t tell you this, but basically if it has the word “Video” in it, I’m pulling out the credit card. In my quest, I always welcome freebies, as well. Today I’m going to share three resources, two of which do not have nearly the buzz they deserve, when compared to the value of their resources. But, then, how do we measure buzz? 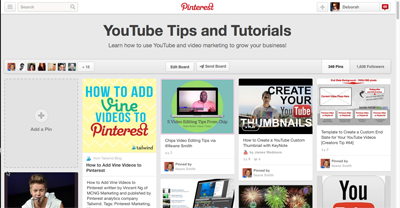 Find the board here, on Pinterest: YouTube Tips and Tutorials. This board is compliments of Super Blogger, Ileane Smith of BasicBlogTips.com. She has created this as a group Pinterest Board and collectively the group adds pins that relate to video production, video marketing, video training, all things video (specifically YouTube). If you are looking for some inspiration, traininng, or even for writing your own article, this is a board you will want to visit, to get ideas. In fact, Ileane’s board inspired me to create a video marketing scoop on scoop.it. Got something you want to see added to either one? Let us know in the comments below. Whether you are a professional videographer or a hobbyist, or anywhere in between, TubeTape has resources for you, from lighting, greenscreening (chromakey) equipment, sound effect, loops, backdrops, software… you name it, they have it! But, what many people may not realize is that they have a section where they offer freebies. This is a great what to sample some of their other packages. For example, one of the News virtual reality sets has a TV screen. So, as a freebie, they may offer that TV screen graphic so that you can play with your own video and make it look like it is playing through a TV screen. That one small graphic may be free for that time, giving you an opportunity to see if you want the whole paid package. The freebies are not all teasers. I have downloaded free lighting diagrams, free tutorials, and more. There are sometimes poster graphics that you can use to make pretend magazine covers, and so much more. If you want to spend a little money, but get a discount, I recommend you sign up for their newsletter where they send out discounted items. Also, find them on ebay (username: tubetape) where you can pick up some of their quality products for half the price. Free Content (and free trial downloads) at Reallusion. This particular resource isn’t for everyone. But, for those who are already using anmiation, or for those who want to try it out, this is a great resource, especially since you can try the software before you buy, and there are some periodic freebies for content. Most of the value with reallusion does come from being a customer. I have been able to purchase software for 50-75% off by watching the deals. But, if you are already using animation software, you may want to watch their freebies, to add to your resources. It is amazing how even one freebie could become your favorite resource for your web series. This happens when they offer fun character packs for free. You can create hours of fun with just one free character pack. However, again, as a reminder, the freebies are generally most helpful if you are using their software. Sometimes it is difficult to find the freebies. They are accessible via your dashboard, if you are a member, but I’ve provided the link above so that you can watch to see what Reallussion makes available to the public, as far as freebies. There you have it. Some of my personal favorites for freebies. I use all three of these resources frequently, but realize that it depends on what your overall objective is. If you are just toying with video and want the easy stuff, then Ileane’s Pinterest Board is a great place to start, to find articles and resources. If you are getting more serious with your video endeavors, you can try TubeTape and Reallusion for some pro tools that pop. YouTube Series: YouTube Resources… Valuable Insights or Lessons in Futility? Hi Deborah! Thanks so much for the shout out and for show casing my YouTube Tips board on Pinterest. Great article here!